Well, now that Thrilling Tales of the Downright Unusual is out in the wild and fending for itself, and I’ve made some progress on some of my post-launch tasks there, I’m being pretty lazy today… and actually looking at Really Neat Things. I just haven’t been doing much of that lately. 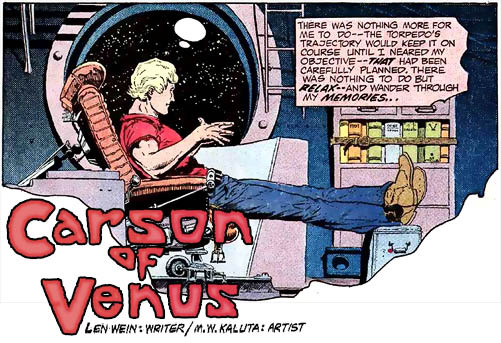 And this Neat Thing really is neat… Diversions of the Groovy Kind has posted scans of two installments of Michael William Kaluta’s Carson of Venus – the Venus stories were my favorites of the Burroughs novels, and they still are now that I’ve dipped back into of them as an old codger. These were back-up stories in a couple of other Burroughs titles at DC comics in the 1970s, and I missed them the first time around. So I was glad to fall over them today. I just wish the whole lot was back in print. You can see Kaluta invoking a bit of Williamson and Krenkel in these pages. Great stuff! Thrilling Tales of the Downright Unusual: It’s Live! 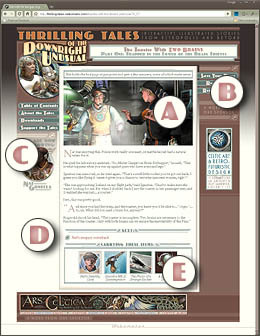 After nine months of work, the Thrilling Tales of the Downright Unusual web site has opened its doors to the public. By which I mean you. 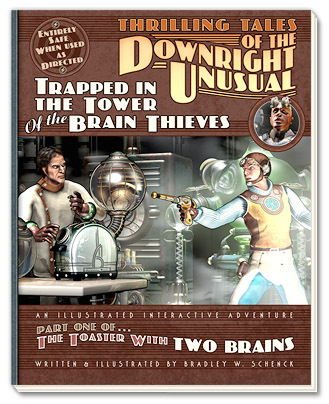 The first story is Trapped in the Tower of the Brain Thieves – that’s Part One of The Toaster With TWO BRAINS. If you’ve been following my blog you’ll already know that the Thrilling Tales project includes the web site, where you can view the illustrated and interactive stories for free, and also the full color book versions of the same stories. Which may be easier to read on the porch, or in the tub, or wherever else you might like to read them. The books, like the web versions, are interactive. You can choose which character you’d like to follow and influence what that character will do in the course of the tale. Back at the web site, you can view embiggified version of the illustrations. You can bring up an inventory panel with close-ups and information about the objects you encounter in the story. You can also save and restore your place within the story. It’s a pretty neat system, and I’m glad I made it. 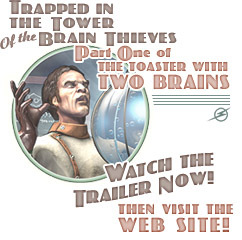 You can see the trailer for The Toaster With TWO BRAINS by clicking here, and then I hope you’ll visit the Thrilling Tales web site. Don’t miss the other areas of the site… most especially the Pulp Sci Fi Title-O-Tron in the Derange-O-Lab. In the downloads section there’s even a smaller version of the Title-O-Tron you can use at your own blog or web site. Don’t mind me. I’m going to keep rambling here, but there’s no reason you have to stick around. I hear there’s drinks in the lobby! The only thing missing that I’d meant to include in the launch is a way to buy a signed book directly from me – my big box o’ books still hasn’t arrived. That type of ordering should go live next week. And there will eventually be another type of story at the site: illustrated but non-interactive stories. That’s because the Thrilling Tales of the Downright Unusual site is almost exactly like a web comic site… except that it’s going to go for months between updates. Due to the nonlinear nature of the stories I can’t just post the "next" page, because that one may not be the "next" page for you. So in order to get regular updates at the site I’ll need to create some linear stories, too. With updates once or twice a week the Thrilling Tales site will have a better chance to build its readership. Anyway… that’s for the future. I’m still working on related merchandise: Thrilling Tales T-shirts are available but posters are still in the works. Those should go up over the weekend, I think. So… it’s been a really long haul for me. I hope you enjoy it! Update: hey, my box o’ books arrived this afternoon, after all! So the “buy from me” link works now, too. 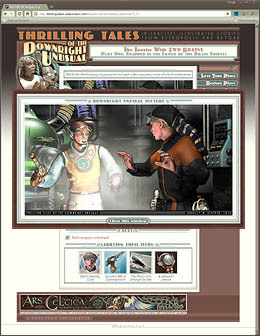 Yes, it’s been very quiet at the Web-O-Blog, for reasons that should be obvious to those who’ve been reading it: I’m down to a very short list of things to do at the new Thrilling Tales of the Downright Unusual web site and I think that it’s shaping up awfully well. E. The Inventory panel, where you can click on an object to learn more about it in another pop-up window. Those are draggable, reloadable, and can be layered with the illustration pop-up in a bevy of ways that are really cool for me, but probably less entertaining for anybody else. As it stands, I’ve probably only got a couple of more days worth of work on the site itself. But it gets a little more complicated since I’m expecting the second – and probably final – proof of the book version, and it’s only when I approve that proof that the book can go on sale. So I won’t be able to hook up the purchasing links until that happens. The trailer has a similar dependency – I’ll need to re-export it and upload it to YouTube (and maybe elsewhere) and I can’t embed it or link to it until that’s done. I also need to order some of the books myself, since one way I’m selling them is directly from me. So there are a couple of possible bottlenecks and a few dependencies yet to resolve. Unless something unexpected happens I figure that the Thrilling Tales site should launch around April 23rd – and very possibly sooner. Oh. And the IRS. I haven’t quite got around to my tax forms yet. Anyway there’s as much stuff as I could shove into the site – desktop wallpapers, screensavers, a version of the random Title-O-Tron that you can install at your blog or web site, and… um, I forget what else. It’s neat, trust me. And someday soon it’ll even be finished! 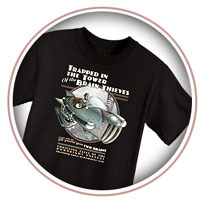 Trapped in the Tower of the Brain Thieves: almost a book! It’s nearly a book! Over the weekend I tested the links between the book’s pages… twice, because on the first time through I found far more errors than I expected to find. The second test turned up none at all, which was quite a relief. Laying out a nonlinear book presents all sorts of problems. I think I discovered most of them. I have an idea or two about how to do better next time but unfortunately there’s no really simple solution. But with that all done, I wrote up and laid out the introduction and designed the cover (hey! That’s it overhead!) with which I am well pleased. You don’t see the back cover here because this is a dramatic re-creation of what the book itself will look like – all 128, full color pages of it! I’ve been through one interesting round of revision with the printer – who knew that some fonts can’t be embedded into a document? – and it’s happily, probably, all sorted now. I just need to have them review the new files and approve them so that I can order a proof copy. And wait. No doubt I’ll find a few things to finesse once I’ve got the proof because, you know, that’s what proofs are for. But for now I need to rotate my brain forty-five degrees and get back to work on the web site. So far, still on track for an April launch.